What Does It Take to Become a Centenarian? What Steps Can Seniors Take to Live Past Age 100? 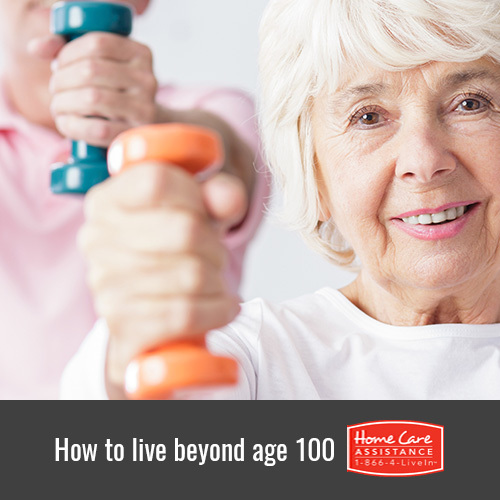 Living for a full century is quite an accomplishment, and many seniors today are wondering what it takes to live such a long and healthy life. Though becoming a centenarian is rare, there are a few things your elderly loved one can do to increase his or her chances of making it to age 100 and beyond. Harrisburg, PA, caregivers discuss the lives of a few people who lived to be centenarians and some of the healthy choices they made that may have helped them down this path. Even though many seniors have access to healthy and affordable food, portion control is still a major problem. Lillian Cox, a 109-year-old resident of Tallahassee, claims eating larger portions in the 1950s began wreaking havoc on her health and waistline, but eating less boosted her health. Filling up on fresh produce before grains and starch can help your loved one cut back on calories while still feeling full after a meal. A long-term survey of over 500 centenarians found 75 percent of them never smoked and only a handful had more than one or two servings of alcohol per week. For those who were still drinking, the vast majority had nothing more than the occasional glass of red wine with dinner. Heavy drinking and the use of tobacco products can increase your loved one’s risk of cancer, dementia, cardiovascular disease, depression, gout, and gastritis. Louise Calder, a Utah resident who lived to be 105, was convinced her stretching and exercise routines enabled her to become a centenarian. Even though she was no longer able to walk a mile a day in the later years of her life, she still tried to stretch and carry out basic calisthenics for at least 30 minutes when she first woke up. If your loved one has developed complications with mobility, balance, and dexterity, he or she may want to try some low-impact exercises like water aerobics or yoga. The importance of having support from friends and loved ones can never be overstated. In addition to providing social and mental stimulation, spending time with your loved one can also enhance his or her psychological and emotional wellbeing. Roberta McRaney of San Augustine, TX, lived to be 102 and claimed heading to church with her family every weekend gave her a reason to make healthy choices and maintain a positive outlook on life. In Okinawa, Japan, living past 100 is not unusual, and scientists have been trying to determine what has helped people in this region live longer and healthier lives. At Home Care Assistance, we created a program based on these studies called the Balanced Care Method (BCM). All of our caregivers are trained in BCM, and they encourage seniors to maintain strong social ties, exercise regularly, eat healthily, and focus on other lifestyle factors that promote longevity. To learn more about BCM and the home care Harrisburg families rely on, call one of our knowledgeable Care Managers today at (717) 540-4663.